The use of synthetic compounds to control pests began in the 1930s and became more widespread after the end of World War II. "First-generation" pesticides were largely highly toxic compounds, such as arsenic and hydrogen cyanide. Their use was largely abandoned because they were ineffective or too toxic. The second-generation pesticides largely included synthetic organic compounds. From about 1945 to 1965, organochlorines were used extensively in all aspects of agriculture and forestry, in protecting wooden buildings and protecting humans from a wide variety of insect pests. In recent years, chemical pesticides have become the most important consciously applied form of pest management. For crops in some areas, alternative forms of pest control are still heavily used, such as burning, rotation, or tillage. The wide use of synthetic pesticides (fungicides, bactericides, nematicides, insecticides, herbicides) dominates high-input production agriculture and forestry. In intensive cropping systems, plant pathogens can reach epidemic populations, endangering crop yields and quality. Soil fumigation is aimed at controlling pests or at least reducing infestations to levels enabling successful growth of commercial crops (Ramsay et al., 1992). Soil fumigants are chemicals (may be solids, liquids, or gases) that, when applied to soil under specified temperature and moisture conditions, generate toxic gases that can kill many kinds of pest organisms as the fumes spread through the soil. Multipurpose soil fumigants used to provide plant disease and nematode control include chloropicrin, dichloropropene, metam-sodium, metam-potassium, and methyl bromide. The latter will be phased out because it has been identified as an ozone-depleting substance. At the rates normally used to reduce populations of nematodes and many weeds and soilborne fungi, fumigants can also kill plants, so they are applied to the planting site weeks before planting. Fumigation does not stimulate plant growth directly; it only reduces numbers of nematodes and other pests for a limited period, during which the plants can produce healthy roots if no other growth-limiting factors are present. Fumigants have no residual effect, so nematodes or pathogens that survive or escape treatment (e.g., are too deep to be reached by the fumigant or are protected inside root tissues and soil aggregates) or are brought in after fumigation can begin to reinfest the root zone immediately. Many synthetic soil fumigants are general biocides that do not target specific genera or pathogens. Therefore, the activity of many soil fumigants has shown negative effects on both beneficial and deleterious populations of soil organisms. Numerous studies show significant reductions in soil processes involved in the cycling of plant nutrients, symbiosis, and soil tilth. Organic pesticides are usually considered as those pesticides that come from natural sources. The fundamental difference between organic and synthetic pesticides is not their toxicity, but their origin—whether they are extracted from natural plants, insects, or mineral ores or are chemically synthesized. These natural sources are usually plants, as is the case with pyrethrum (pyrethins), rotenone, or ryania (botanical insecticides), or minerals, such as boric acid, cryolite, or diatomaceous earth. Two of the most common organic pesticides, copper and sulfur, are used as fungicides by organic growers. Because they are not as effective as their synthetic counterparts, they are applied at significantly higher rates. Copper fungicides are used to treat foliage, seeds, wood, fabric, and leather as a protectant against blights, downy mildews, and rusts. In agriculture, copper compounds, especially copper sulfate, are used as fungicides, pesticides, algicides, nutritional supplements in animal feeds, and fertilizers. Copper is the 18th most used pesticide in the United States. Over 13 million pounds of copper were applied to 54 crops in 1997. Copper, oil, and sulfur combined accounted for a full 25% of U.S. pesticide use. Organic pesticides are largely insecticides and nematicides, although they do have efficacy against some bacterial and fungal pathogens. The efficiency of oilseed meals of neem (Azadirachta indica), castor (Ricinus communis), mustard (Brassica campestris), and duan (Eruca sativa) has been evaluated against plant-parasitic nematodes and soil-inhabiting fungi that infest a number of crops. The population of plant-parasitic nematodes, Meloidogyne incognita, Rotylenchulus reniformis, Tylenchorhynchus brassicae, Helicotylenchus indicus, etc., and the frequency of the pathogenic fungi Macrophomina phaseolina, Rhizoctonia solani, Phyllosticta phaseolina, Fusarium oxysporum f. ciceri, etc., have been significantly reduced by these treatments; whereas populations of saprophytic fungi have increased. Soil solarization is a nonchemical technique used for the control of many soil-borne pathogens and pests (Katan and Devay, 1991; Gamliel et al., 2000). This simple technique captures radiant heat energy from the sun, thereby causing physical, chemical, and biological changes in the soil. Transparent polyethylene plastic placed on moist soil during the hot summer months increases soil temperatures to levels (71°C) lethal to many soilborne plant pathogens, weed seeds, and seedlings (including parasitic seed plants); nematodes; and some soil-residing mites. Soil solarization also improves plant nutrition by increasing the availability of nitrogen and other essential nutrients. Beneficial microbial populations, such as mycorrhizal fungi, Trichoderma sp., actinomycetes, and some beneficial bacteria survive the solarization process and rapidly recolonize the soil. These is turn may contribute to a biological control of pathogens and pests and/or stimulate plant growth. Soil solarization also has been shown to be effective at reducing nema-tode populations, but less dramatically than it does fungal pathogens and weeds. 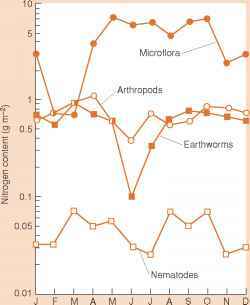 Nematodes generally are more tolerant of heat and control is less effective in soil depths beyond 12 in. Solarization may therefore be useful and economically feasible for shallow-rooted crops.